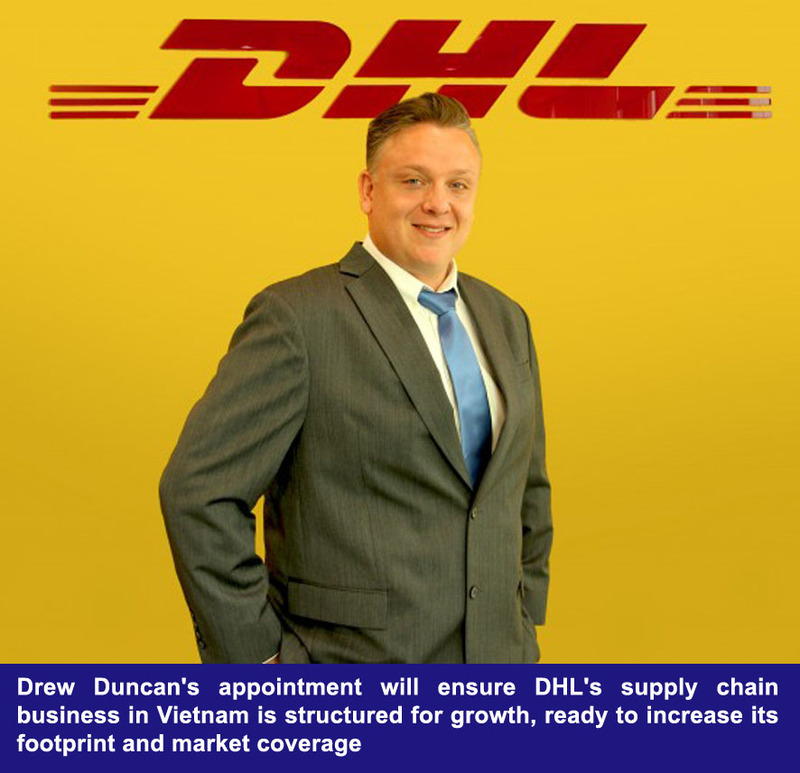 DHL Supply Chain, the global market leader for contract logistics solutions, announced the appointment of Drew Duncan as Managing Director of DHL Supply Chain Vietnam. In his new role, Drew will manage the strategic development of DHL Supply Chain Vietnam, steering growth in warehouse management, transportation management and value added supply chain services. Drew has more than 13 years’ experience in the logistics industry and has spent six years with DHL Supply Chain Thailand. Prior to this appointment, Drew was the Vice President – Retail, managing a combined workforce of over 6,000 personnel, 30 distribution centers and a fleet in excess of 3,000 vehicles. Drew is a pioneering leader of change, and has employed many globally tested supply chain innovations in its local operations, yielding significant improvements in cost and service for the customers. Kevin Burrell, CEO, DHL Supply Chain Thailand Cluster (Thailand, Vietnam, Cambodia and Myanmar), said: “Vietnam’s economy is growing rapidly, and this dynamic environment demands a leader who drives constant improvement across all areas of our business. We are pleased to announce the appointment of Drew Duncan as Managing Director of our operations in Vietnam. Having worked in Southeast Asia for half of his career, Drew has a keen understanding of regional and local culture. With his illustrious track record and rich experience working within DHL, we are confident of fulfilling our promise of being the leading enabler for our customers in the country and contributing to improving our consumers’ daily lives. We have huge ambitions for our business in Vietnam, and look forward to capitalizing new opportunities under Drew’s stewardship”. DHL aims to provide a one-stop service for logistics supply chain integration to global standards, supporting local and international customers in various sectors – Retail, Consumer, Technology, Automotive, Life Sciences, Chemical, Engineering and Manufacturing. Its diverse expertise enables speedy operational set-up for customers from all sectors using DHL’s multi-user warehouses and transport networks. DHL Supply Chain sees a real opportunity in Vietnam to help its customers grow successfully and constantly improve safety, quality and cost management through innovation and market differentiated services. DHL is the leading global brand in the logistics industry. DHL family of divisions offer an unrivalled portfolio of logistics services ranging from national and international parcel delivery, e-commerce shipping and fulfillment solutions, international express, road, air and ocean transport to industrial supply chain management. With about 350,000 employees in more than 220 countries and territories worldwide, DHL connects people and businesses securely and reliably, enabling global trade flows. With specialized solutions for growth markets and industries including technology, life sciences and healthcare, energy, automotive and retail, a proven commitment to corporate responsibility and an unrivalled presence in developing markets, DHL is decisively positioned as “The logistics company for the world”.